Here is the second layout I made for Scrap-Info Russian Scrapbooking Magazine! DESCRIPTION: Lots of things I love all rolled up into one page: stitching, a big background element, traveling, and COLOR! 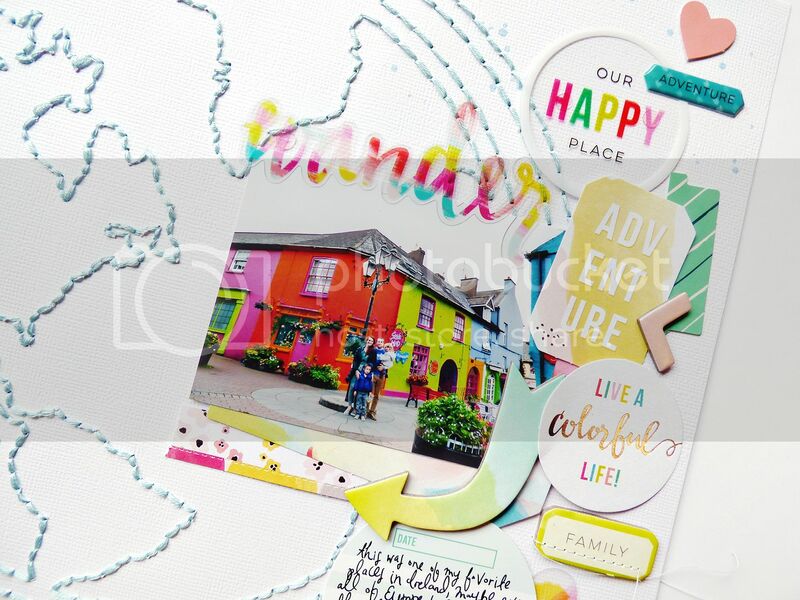 JOURNALING SAYS: This was one of my favorite places in Ireland, maybe even all of Europe because of all the colors! Be still my heart! I hope we get to go back to Kinsale some day when it's nice and warm and relax in this spot. 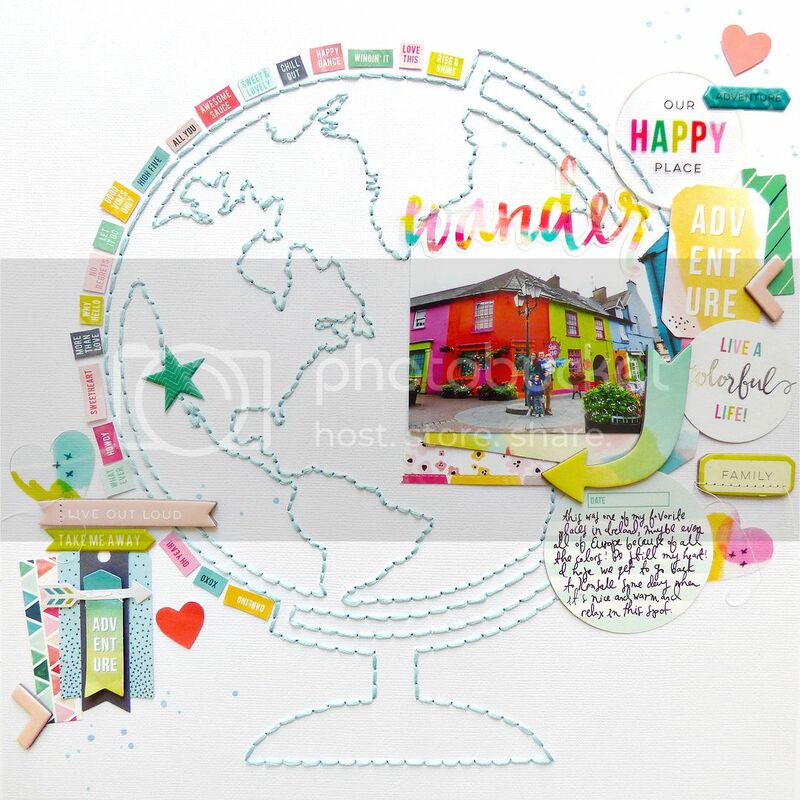 HOW TO: This globe is a super old Two Peas cut file (RIP :( so I encourage finding a similar one in the Silhouette store (click on that link to go right to globes) or send me an email! Replace the blade with a pen and draw the globe onto white cardstock, poke a hole every 1/4" all around, then backstitch with blue thread. 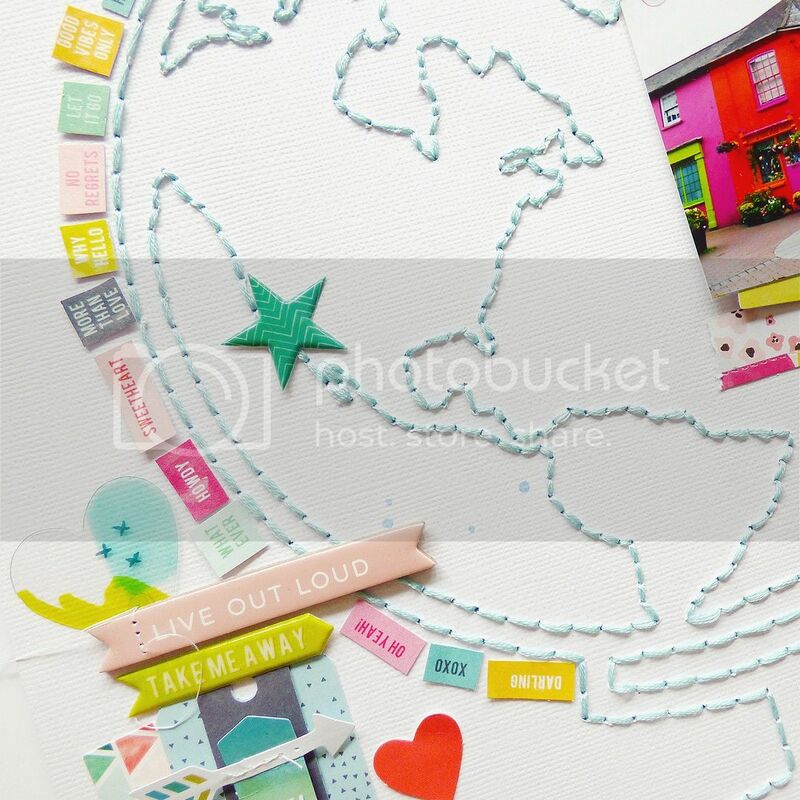 Create two clusters of embellishments - one on the top right including the photo and journaling, and the other on the bottom left; this helps draw the eye all around the page. I placed a puffy star sticker over "Los Angeles" which was our last home. Germany is covered up or I would have put it there. I cut out the phrases from the 6x6" circles paper and glued them around the curve of the globe and added machine stitching here and there for more texture and whimsy. Lastly I dropped blue watercolors over the embellishment clusters. One more layout to share! I cannot say it enough, you simply amaze me!! This is BEYOND WOW!!!! I loveeeeeeeeeee it!!!!!!!!!!!!!!!!!!!!!! Wow! I'm picking my jaw up off the floor....this is beyond stunning! Wow. This is amazing. Love love love!! Oh my!!! That is beyond amazing!!!!! !